← The Oysters Are Coming! The Oysters Are Coming! We often sit in slack-jawed wonder when our favorite bistro goes belly-up in less than a year, or when a popular gourmet food truck disappears off the road into the golden sunset, so imagine the kind of quality and service you'd have to deliver in order to get patrons to come back repeatedly for nearly 300 years. Madrid's Sobrino de Botín is the epitome of that spirit, and one visit to the world's oldest restaurant (according to Guinness Book of World Records) is all it takes to demonstrate what made it one of Ernest Hemmingway's favorites. 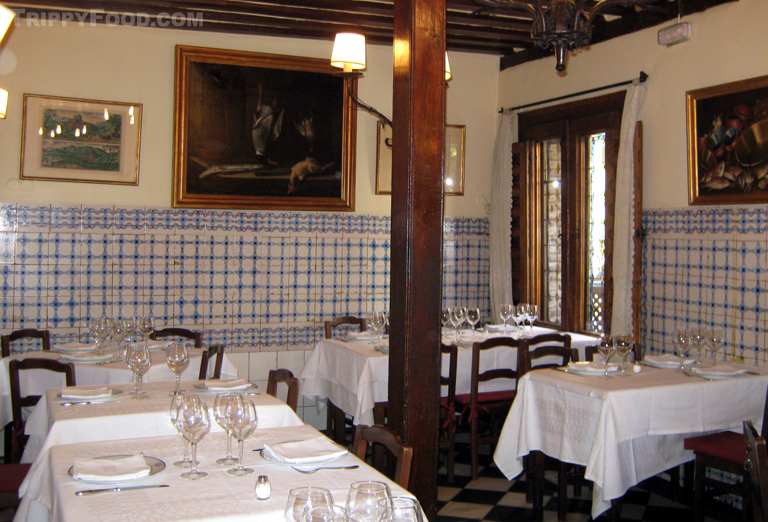 The restaurant was originally established in 1725 as Casa Botín by James Botín, who passed it in to his nephew upon moving on to the great Zagat guide in the sky (thus the current name, Sobrino de Botín - Botín's Nephew). 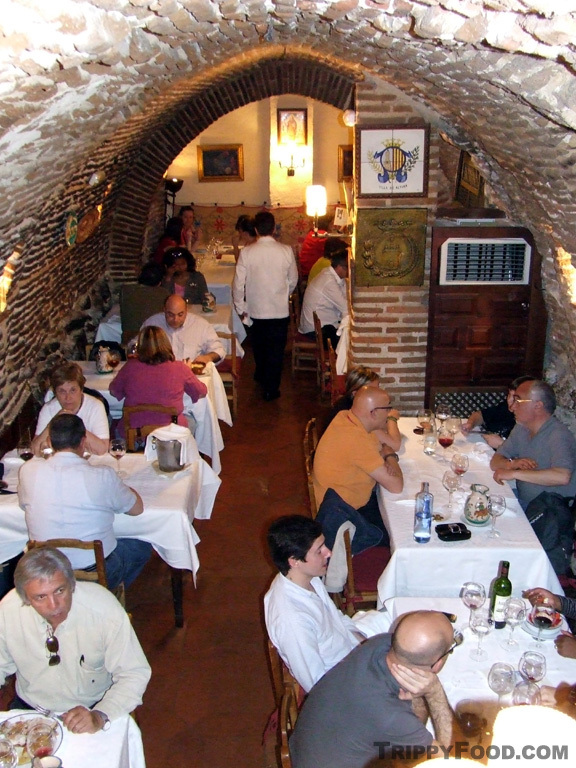 The restaurant has been so popular through the centuries that it has been mentioned in Spanish and English literature by such notables as F. Scott Fitzgerald, John Dos Passos and the aforementioned Mr. Hemingway; a young Francisco José de Goya waited tables at Botín well before his stint as painter to the Spanish Crown. Sobrino de Botín is located just steps below Madrid's Plaza Mayor; in addition to being the oldest restaurant in the world, it also remains one of the most popular. The crowd is lighter at lunchtime, but it's best to arrive prior to the restaurant opening - you may have to wait past stated opening hours to get in, but you can probably cut them some slack since they literally have all the time in the world. 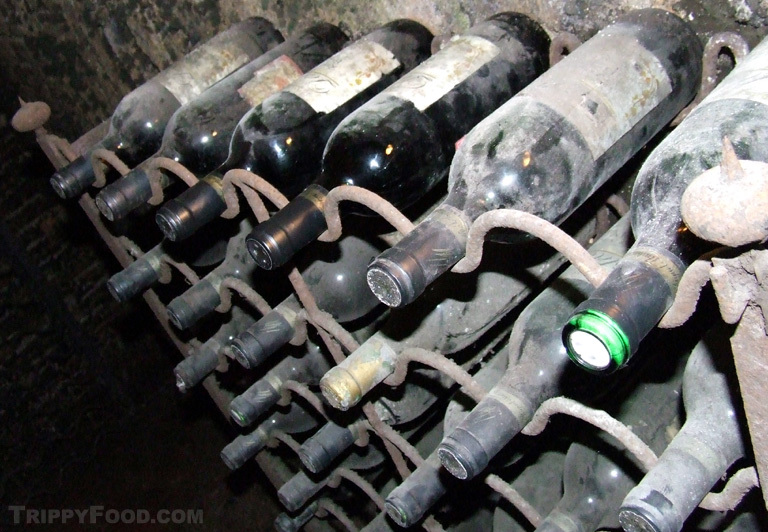 The interior is a sprawling collection of rooms spanning four floors (including the brick-ceiling basement); you'll want to explore, but you'd be best advised to wait until after your meal. Each dining room has its own sense of flavor and style, but all reflect the restaurant's long lineage; if you can swing it, the rooms on the upper floors allow more natural light in, but there's something to be said for eating in a room that looks like a taller and better lit version of Liverpool's Cavern Club. The Spanish know a thing or two about pork - Iberian ham appears on almost every menu in the city and there's even a shop called Museo de Jamón devoted solely to Porky's hindquarters. There are a variety of ham appetizers on the menu, but these aren't the big moist chunks of pork you're used to seeing on the holiday table; think prosciutto. 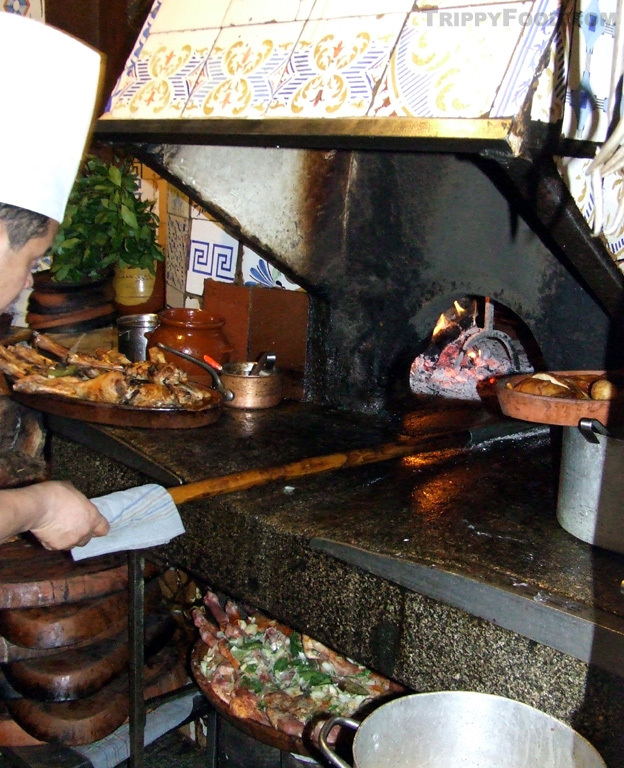 Botín's specialties are cochinillo asado (roast suckling pig) and cordero asado (roast lamb) and unless you want to try a variety of dishes from the menu, the perfect dining experience is to stick with the House Menu. For about 40 Euro you'll enjoy a bowl of soup, the cochinillo asado, bread, a beer, wine or mineral water and dessert; although the baby eels are tempting, you'd better be prepared to shell out close to $150 for a dish of the tiny, ropy fish. Keep in mind that although nominal, when ordering off the regular menu as in most of Europe you'll be charged extra for items such as bread and butter. The soup is seasonal - if you time your visit right you may have the opportunity to try their sopa de ajo, which features egg poached in chicken broth and garlic, another Botín specialty; our dinner came with a crisp, rich and flavorful gazpacho. The suckling pig is roasted in the same oven (the horno de asar listed on the sign on the front of the restaurant) that's been used since 1725; your waiter will bring a segment to the table in a clay dish and separate the meat for you. 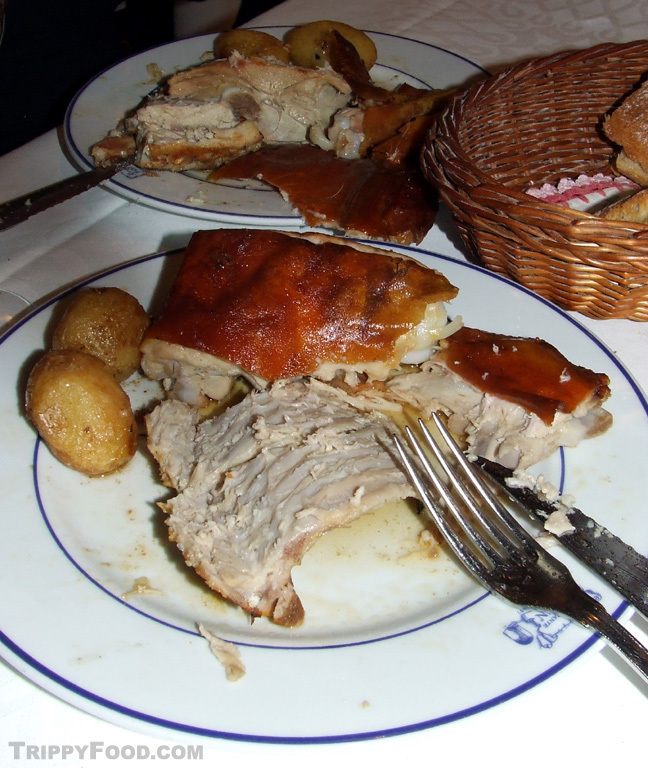 The pork is incredibly moist, still sheathed in a crackly chicharrón jacket. The contrast of the hot, tender pork with the crunchiness of the skin is heaven in your mouth - it's easy to see why Botín is renowned for its cochinillo asado, so good it has been mentioned in the final chapter of Hemmingway's "The Sun Also Rises". After your meal you'll want to explore the premises - the staff is extremely accommodating and will give you access to literally every square inch of the restaurant. The closet-sized kitchen where the stone roasting oven is housed is manned by a single chef who presides over shelves filled with piglets peering over clay dishes with lifeless eyes. Even though the chef scrambles to fill orders for the succulent hogs, he'll still gladly answer any question you have and allow you to watch to your heart's content while he stuffs Babe into the inferno on the end of a pizza peel. 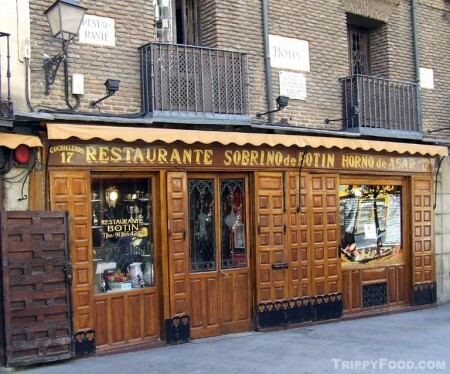 This entry was posted in Spain and tagged 1725, Albae Tempranillo, baby eels, cochinillo asado, cordero asado, Ernest Hemmingway, garlic, gazpacho, Goya, Guinness Book of World Records, ham, horno de asar, House Menu, Iberian, lamb, Madrid, oldest restaurant in the world, pork, Sobrino de Botin, sopa de ajo, Spain, suckling pig, wine cellar. Bookmark the permalink.